Out of space? Mobile-responsive sites won’t take up storage on your device! We’ve been seeing a growing trend for providers of e-resources (ejournals, ebooks, videos, and the like) to adapt the display of their content to mobile devices rather than create a whole separate app. Many of the platforms to which McGill Library has subscriptions use these mobile-adapted web interfaces. Responsive websites have the benefit of seamless access–either you’re on the McGill network or you can use EZproxy or VPN, but the result is the same. A second benefit is the reduction in storage space requirements. Is your 16GB device just a little too full for comfort? No space? No worries! Mobile websites do not download data onto the device so will not affect storage. Some websites will offer you the option to add an icon to your home-screen but this is simply a web link to the website, rather than an app in itself. 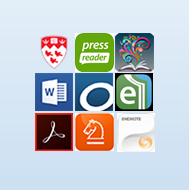 If you do use these web icons from your home-screen and you are not physically on campus, you will need to use the Cisco Anyconnect VPN client to make sure the resources knows you are a McGill Library patron. The mobile landscape in general is adapting to user behaviour with some vendors changing focus from apps towards responsive websites, and sometimes a website is all you need. If you’re online, you’re good to go!